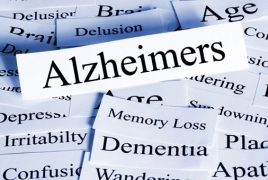 PanARMENIAN.Net - Using technology similar to what is found in many eye doctors' offices, researchers at Washington University School of Medicine in St. Louis have detected evidence suggesting Alzheimer's in older patients who had no symptoms of the disease, Xinhua reports. The study used a noninvasive technique called optical coherence tomography angiography to examine the retinas in eyes of 30 study participants with an average age in the mid-70s, none of whom exhibited clinical symptoms of Alzheimer's. About half of the participants in the study had elevated levels of the Alzheimer's proteins amyloid or tau as revealed by PET scans or cerebrospinal fluid, suggesting that although they didn't have symptoms, they likely would develop Alzheimer's. In the other subjects, PET scans and cerebrospinal fluid analyses were normal. "In the patients with elevated levels of amyloid or tau, we detected significant thinning in the center of the retina," said Rajendra S. Apte, a professor of ophthalmology and visual sciences at the university. "All of us have a small area devoid of blood vessels in the center of our retinas that is responsible for our most precise vision. We found that this zone lacking blood vessels was significantly enlarged in people with preclinical Alzheimer's disease." "The retina and central nervous system are so interconnected that changes in the brain could be reflected in cells in the retina," said Apte. More studies in patients are needed to replicate the findings. But if changes detected with this eye test can be used as markers for Alzheimer's risk, it may be possible one day to screen people as young as in their 40s or 50s to see whether they are at risk for the disease. Significant brain damage from Alzheimer's disease can occur years before any symptoms such as memory loss and cognitive decline appear. It is estimated that Alzheimer's-related plaques can build up in the brain two decades before the onset of symptoms, so researchers have been looking for ways to detect the disease sooner.